LAGOS — THE year 2018 was one that many Nigerian families would want to forget in a hurry but alas they cannot. 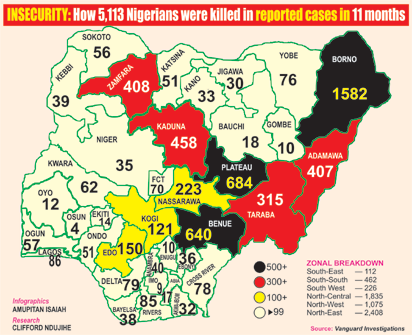 Reason: Many families across all states of the country lost members to the flickering flames of insecurity, which according to Vanguard’s tally claimed no fewer than 5,113 persons as of November 2018. Specifically, deaths taken into account are those arising from sectarian violence, herdsmen and farmers’ clashes, Boko Haram insurgency, cult clashes, and armed robbery.